The top two seeds in the AL will fight for the pennant, but who has the edge in a very evenly matched ALCS: the Blue Jays or the Royals? For the first time since 2009, the American League Championship Series will feature the two teams with the league’s best regular-season records: the Royals (95–67) and Blue Jays (93–69), both of whom needed a full five games to eliminate their Division Series opponents. This matchup also marks the 30th anniversary of the only playoff confrontation between these two teams: the 1985 ALCS. Against a Blue Jays team making its first-ever postseason appearance, the Royals won the pennant in dramatic fashion, rallying from 0–2 and 1–3 deficits to win the final three games, including Games 6 and 7 in Toronto’s jerry-rigged Exhibition Stadium, en route to their first World Series title. Toronto eventually reached the World Series in 1992 and won it in both that year and in '93, but the Jays haven’t been back since. The Royals, meanwhile, haven’t won a championship since 1985. Kansas City is obviously hoping history will repeat itself this year. But in facing a Toronto team that just snapped a 21-year playoff drought, the Royals, who snapped a 29-year drought of their own last year, find themselves in the odd position of not being the underdogs for a change. After all, the Royals are the defending AL champions and the top seed in the league this October, a status which gives them home field advantage for this series. In truth, these teams are very evenly matched. Yet despite the fact that they both play outstanding defense and both acquired a rotation ace in late July, they are quite different in their construction. The Blue Jays had the best offense in baseball this year, and it wasn’t close. They scored 5.5 runs per game; the runner-up scored 4.7. They posted a team OPS+ (which corrects for their offense-friendly home ballpark) of 118; no other team’s was above 106. They also led the majors in home runs (232), doubles (308), walks (570), on-base percentage (.340) and slugging (.457). But despite all of the power in that lineup, Toronto ranked 24th in strikeouts. It’s not often you see a contact-oriented team lead the majors in home runs and walks. In fact, the last two teams to lead the majors in home runs and walks and finish in the bottom ten in strikeouts were the 2009 Yankees and 1987 Tigers. This year’s Blue Jays also led the majors in stolen-base percentage, swiping 88 bags at a 79% success rate, led by centerfielder Kevin Pillar’s 25 in 29 attempts and despite speedy leftfielder Ben Revere not joining the team until August. There is nothing Toronto didn’t do well at the plate or on the bases this season, and the team only got better after the trading deadline: The Jays have averaged 6.1 runs per game from Aug. 1 through Game 5 of the ALDS. The Royals make more contact than any other team in the majors; as a result, they were the only team in baseball not to strike out 1,000 times this season. But while they were last in strikeouts, they were also 29th in walks and pitches seen per plate appearance. Kansas City's offense is old school, based around inside-the-park hits and speed (the Royals were fifth in the majors in steals and stolen-base percentage with 104 steals at a 75% success rate, but 24th in home runs). That shouldn’t surprise anyone who watched last year’s postseason, but the Jays can play that game as well. In addition to the team's high-percentage base stealing, league-leading doubles total and relatively low strikeout rate (18.5%, fifth-lowest in the majors), Toronto had a team batting average of .269 on the season, good for second-best in baseball and just ahead of the Royals’ third-place figure (.2687 to Kansas City’s .2685). The biggest question marks here are what each team will get out of the rental ace they acquired at the trading deadline. Price and Cueto both had poor postseason track records coming into this year’s playoffs, and both continued their struggles in their first start of the Division Series. Cueto got another shot in Game 5, however, and came up huge, holding the Astros to just two base runners (both of whom scored) over eight innings and retiring the last 19 men he faced. Assuming that their postseason failings have had a mental component, Cueto would seem to have finally cleared his mind, even if he might have been helped by a dead-team-walking Houston lineup. Price, however, didn’t get a second Division Series start. Instead he was used, inexplicably, for three innings of relief with Toronto holding a six-run lead in the middle innings of Game 4; he needed 50 pitches to get through those three frames and gave up three runs in the process, inflating his career postseason ERA to 5.04. Price has had solid postseason starts in the past, most notably his eight innings of two-run ball in Game 5 of last year’s Division Series between the Tigers and Orioles. 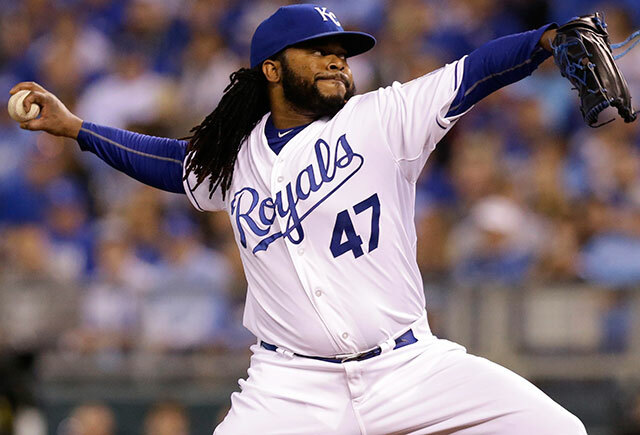 Every time he has made a quality start, however, he has been out-dueled and suffered a loss. Meanwhile, over his last three appearances this year, including his final regular-season start, he has allowed 13 runs (12 earned) in 15 innings. His poor outing on Sept. 26 prompted the Jays to skip his last scheduled regular-season start, and as a result, he started Game 1 of the Division Series on 11 days' rest. In Game 4, he pitched on three days' rest and made his first relief appearance since 2010. Price will start Game 2 of this series on regular rest and, if necessary, Game 6 on five days' rest. That should restore some sense of normalcy to his routine, but it’s unclear if it will allow him to return to being the pitcher who went 8–1 with a 1.95 ERA in his first ten starts for Toronto. If Price and Cueto are both on their games, they obviously have the upper hands in their respective matchups, though if either is slightly off, the Blue Jays would seem to have a better chance to capitalize with Stroman than the Royals would with Ventura. Postseason included, Stroman has a 2.25 ERA in six starts since returning from the torn anterior cruciate ligament that cost him most of the 2015 season and, as a result of that injury, has a much fresher arm than Ventura, who has thrown 170 1/3 innings on the season. In his lone start against the Jays this season, Ventura gave up five runs in seven innings, with three of those runs scoring on home runs by Josh Donaldson and Jose Bautista. This is the Royals’ calling card, and for good reason. Kansas City’s regular-season bullpen ERA of 2.72 was second-best in the majors behind that of the Pirates, and the bullpen’s OPS against was a major league-low .629. Closer Wade Davis, who was promoted from the ninth inning when Greg Holland underwent Tommy John surgery, has posted a 0.91 ERA in 157 2/3 innings between the regular and postseasons since the start of 2014, making the Royals’ ninth inning as automatic as any in baseball. The rest of the bullpen isn’t quite as untouchable as it was last year, but setup men Kelvin Herrera and Ryan Madson—who typically work the seventh and eighth innings, respectively—are as impressive a duo as you’ll find. No one else in the Royals’ bullpen saw regular work in the ALDS, but veteran Franklin Morales had a nice season as the team’s primary lefty. He is complemented by re-purposed lefty starter Danny Duffy in the postseason, not that there’s much need to play matchups against the predominantly righthanded Blue Jays lineup. Righty Luke Hochevar struggled down the stretch but didn’t allow a run in 3 1/3 innings against Toronto this season or in 2 2/3 in the Division Series and can get manager Ned Yost more than three outs when needed. Whomever doesn’t start Game 4, Young or Medlen, will be the long man. The Blue Jays significantly upgraded their bullpen at the trading deadline, acquiring Mark Lowe and LaTroy Hawkins and moving rookie starter Aaron Sanchez into the primary setup role with the addition of Price to the rotation. However, the ‘pen took a hit in the Division Series when primary lefty Brett Cecil went down with a strained calf. Cecil was removed from the Division Series roster in favor of righty rookie Ryan Tepera and is thus ineligible for this series. That leaves Aaron Loup, who left the team during the final two games of the Division Series for personal reasons, as the lone lefty in the Jays’ bullpen. Manager John Gibbons will have to chose his spot carefully with Loup given that Eric Hosmer, Mike Moustakas and Alex Gordon all pose a lefthanded threat in the Royals' lineup. None of those three hit consecutively in the order, but it’s worth noting that switch-hitter Kendrys Morales, who hits between Hosmer and Moustakas, was far less dangerous from the right side this year (slugging .412 compared to .538 lefthanded), so using Loup for all three of those batters would not be a mistake on Gibbons’ part. As for the two new additions, Lowe has been good but not great, while the 42-year-old Hawkins fell into disuse in September and took the loss in his only appearance in the Division Series, giving up three straight two-out singles to allow the Rangers to take the lead in the 14th inning of Game 2. Don’t look for Hawkins in key situations in this series. If Gibbons needs a third righty after (or before) Lowe and Sanchez, he’s more likely to turn to Liam Hendriks, the former Twins starter and soft-tossing sinkerballer acquired from the Royals in the Danny Valencia trade who has reinvented himself this year as a short reliever with upper-90s heat and a wipeout slider. Betting against the resilient Royals, who are now 4–1 when facing elimination over the last two postseasons and had the tying run at third base in their lone elimination loss, seems foolish, but I said the same about the Cardinals when I picked the Cubs in their Division Series matchup, and that worked out. This matchup is similar. The Royals, surprisingly, have the postseason pedigree and the scrappy, contact-hitting, speed-defense-and-relief-pitching construction that seem such a good fit for the playoffs, while the Blue Jays seem to be built around two elite starting pitchers and a lineup of mashers. The Jays are even better defensively than the Royals, however (Toronto led the majors in park-adjusted defensive efficiency this year), have their share of speed, make plenty of (harder) contact and have a shut-down duo at the back of their bullpen as well. To my eye, the Blue Jays are just the better team, and in the longer best-of-seven format, I think that will bear out.